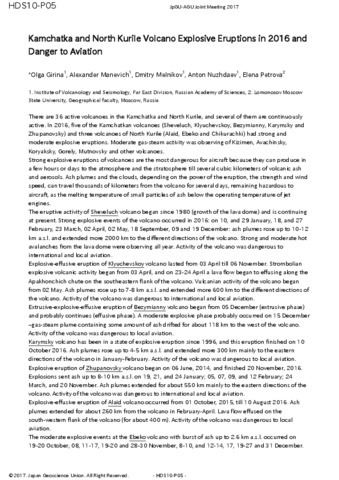 Girina O.A., Manevich A.G., Melnikov D.V., Nuzhdaev A.A., Demyanchuk Yu.V., Petrova E. Explosive Eruptions of Kamchatkan Volcanoes in 2012 and Danger to Aviation // EGU General Assembly 2013. Geophysical Research Abstracts. Vienna, Austria: 2013. V. V15. № 6760-1. 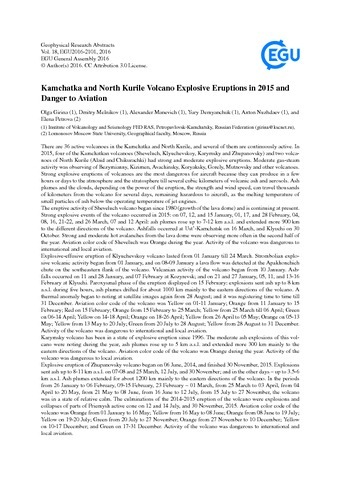 Girina O.A., Manevich A.G., Melnikov D.V., Nuzhdaev A.A., Demyanchuk Yu.V., Petrova E. Strong Explosive Eruptions of Kamchatkan Volcanoes in 2013 // Abstracts. Japan Geoscience Union Meeting. Yokohama, Japan: JpGU. 2014. № 00275. Girina O.A., Manevich A.G., Melnikov D.V., Nuzhdaev A.A., Petrova E. Kamchatka and North Kurile Volcano Explosive Eruptions in 2016 and Danger to Aviation // JpGU-AGU Joint Meeting 2017 Abstracts. Chiba, Japan: Japan Geoscience Union. 2017. Girina O.A., Manevich A.G., Melnikov D.V., Ushakov S.V., Nuzhdaev A.A., Konovalova O.A., Demyanchuk Yu.V. KVERT Project: Danger for Aviation during Eruptions of Kamchatkan Volcanoes in 2009-2010 // Abstracts. International Workshop “JKASP-7”. Petropavlovsk-Kamchatsky. August 25-30. 2011. Petropavlovsk-Kamchatsky: IVS FED RAS. 2011. P. 29-30. Girina O.A., Manevich A.G., Nuzhdaev A.A., Konovalova O.A., Ushakov S.V., Melnikov D.V. 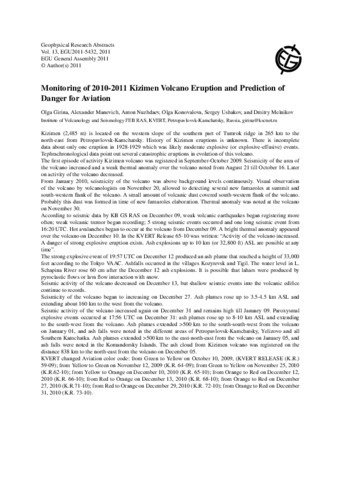 Monitoring of 2010-2011 Kizimen Volcano Eruption and Prediction of Danger for Aviation // EGU General Assembly. April 3-8. Vienna, 2011. Abstract. EGU2011-5432. 2011. V. 13. Girina O.A., Manevich A.G., Ushakov S.V., Nuzhdaev A.A., Melnikov D.V., Konovalova O.A., Demyanchuk Yu.V. 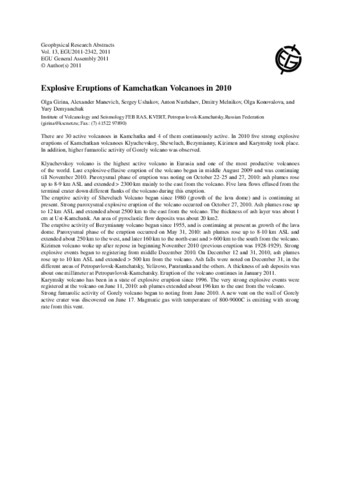 Explosive Eruptions of Kamchatkan Volcanoes in 2010 // Abstract. EGU General Assembly. April 3-8. Vienna. 2011. EGU2011-2342 (XY 513). 2011. V. 13. Girina O.A., Melnikov D.V., Manevich A.G., Demyanchuk Yu.V., Nuzhdaev A.A., Petrova E. Kamchatka and North Kurile Volcano Explosive Eruptions in 2015 and Danger to Aviation // Geophysical Research Abstracts Vol. 18, EGU2016-2101, 2016 EGU General Assembly 2016. EGU General Assembly 2016. 2016. doi: 10.13140/RG.2.1.5179.4001. Girina O.A., Melnikov D.V., Manevich A.G., Nuzhdaev A.A. Satellite monitoring of the Kamchatkan active volcanoes // Modern Information Technologies in Earth Sciences. Proceedings of the International Conference, Petropavlovsk-Kamchatsky, September 8-13, 2014. Vladivostok: Dalnauka. 2014. P. 51-52. Girina O.A., Melnikov D.V., Manevich A.G., Nuzhdaev A.A., Demyanchuk Yu.V. 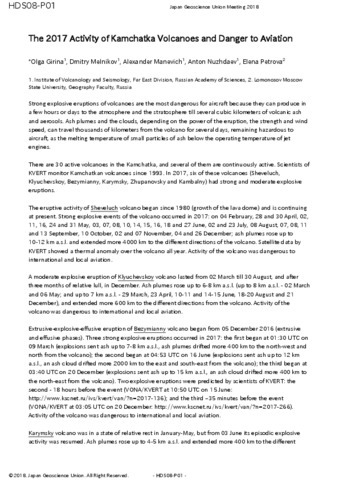 Kamchatka Volcano Explosive Eruptions in 2017 and Danger to Aviation // EGU General Assembly 2018. Viena: EGU General Assembly 2018. 2018. № 3805. 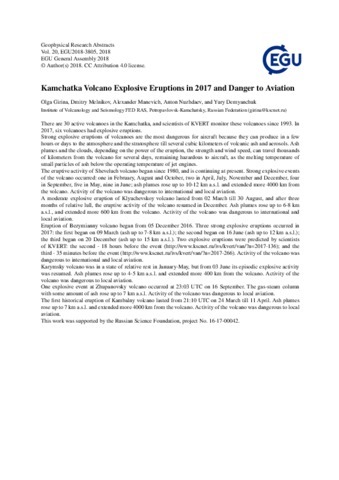 Girina O.A., Melnikov D.V., Manevich A.G., Nuzhdaev A.A., Petrova E. The 2017 Activity of Kamchatka Volcanoes and Danger to Aviation // Abstracts. JpGU2018. May 20-24, 2018. Chiba, Japan. 2018.